Dance DTLA is short for Dance Downtown Los Angeles. 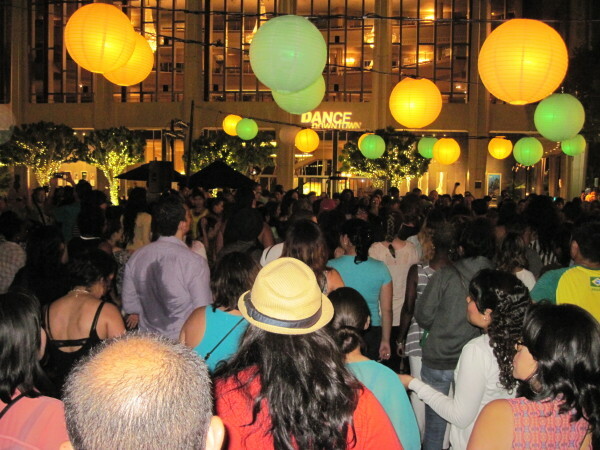 Since 2005, over 50 dance styles have been presented, for free, at the Los Angeles Music Center Plaza and Grand Park. The event includes dance lessons with music provided by a DJ or live band. Parking is accessed on Grand and the Metro is a great way to travel to ‘Dance Downtown’. No RSVP is required, but, dancing is mandatory…or, simply enjoy the video posted below to have Free Fabulous Fun! The Music Center announcement for ‘Free Fabulous Fun’ says, “The floor is yours!. Move and shake the night away under the starry skies.” The 2014 schedule began on May 16th to celebrate the 100th Dance Downtown with 60s music. The summer program ends on September 19th with Salsa. Photo and film opportunities abound when you are having ‘Free Fabulous Fun’! Note: Food is not allowed on the large dance floor; however, there is plenty of room to set up a picnic table as depicted in the video posted below, and, all ages are welcomed to participate. 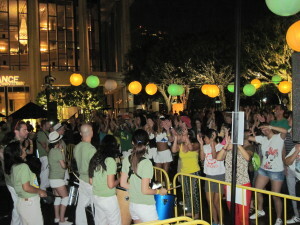 Dance Downtown is a vibrant and resonating event that makes you smile and laugh the night away in utter glee. Hundreds were caught up in the jubilee of Samba rhythms and energetic sway on August 8, 2014. Dancers showed off their traditional ballroom steps, the exotic flare of Brazilian combinations, and hip-hop gyrations. It was astounding and euphoric…everyone’s body moved to the samba music and Brazilian drums! Dance across the plaza, down the steps, and across the street to be captivated by the ever changing colors of the Grand Park water fountain and pools. You may be lucky enough to be mesmerized by children splash-dancing as they prance through the water on warm summer nights. I was!